Kinerase Instant Radiance Facial Peel - There is your average once a week facial scrub to rid of dead skin cells and then there are full on peels to really reveal gorgeous skin. Peels can restore a more youthful look to the skin. 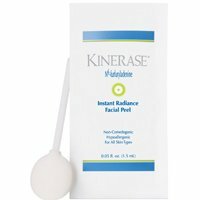 The Kinerase Instant Radiance Facial Peel is an at home peel. It exfoliates and smooths skin with minimal to no irritation. It really helps with breakouts, fine lines, and wrinkles. All skin types. Those with sensitive skin should use with caution. Remove applicator from pouch. Swab face and neck. Don't rinse peel off. Do not apply near eyes, corner of mouth or inside of nose. Repeat daily for 5 days. Allow 2 weeks between peels. If your skin becomes irritated discontinue use. Water, Aloe Barbadensis Leaf Juice, Lactic Acid, Saccharide Isomerate, Tromethamine, Camelia Sinensis Leaf Extract, Zeatin, Algae Extract, Artemisia Vulgaris Extract, Saccharum Officarum Extract, Citrus Medica Limonum Extract, Citrus Aurantium Dulcis Extract, Pyrus Malus Extract, Diazolidinyl Urea, Iodopropynyl Butylcarbamate, Phenoxyethanol, Methylparaben. "Was not crazy about it, it left my skin feeling sticky." "Finally something works for my cystic acne scars. It makes them less visible. This is the first product that has worked." "I love this product One application and my skin is glowing all week." "I have super sensitive skin. This product broke me out into tiny bumps. I won't be using it anymore." "This is the first peel that gave me results without any irritation."